There are a lot of colors in this week's color challenge on Kristina Werner's blog (http://www.kwernerdesign.com/ ) but they flow together really well so I tried an experiement. I'd been wanting to see how it would look to make my own background using the Pretty Petals stamp set. Normally this set is stamped and colored with markers or crayons. How would it look to emboss and then go over the entire thing with pastels? I did two samples. I think the one below is the prettiest version; however, the one above made the most balanced card. Actually I still haven't quite figured out what to do with the one below. 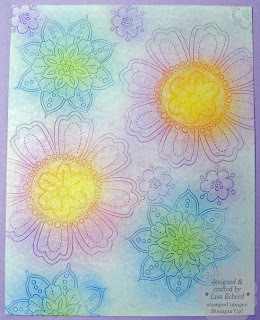 Using three of the stamps, I inked in Versamark and stamped on Whisper White cardstock. Then embossed with white embossing powder. 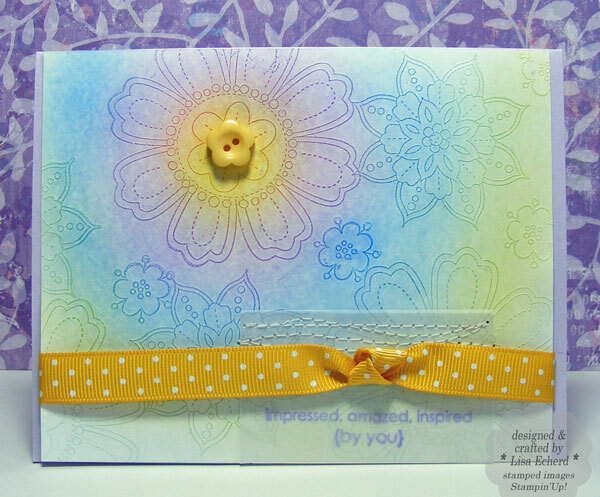 The color was added with Stampin' Pastels. I find that I often have to use a darker shade of the pastels to get the color I really want. The greeting is stamped on vellum and stitched in place. 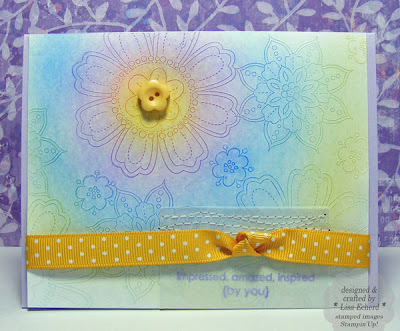 Ingredients: Stamps: Pretty Petals; Sweet Little Sentiments for greeting both by Stampin' Up! Ribbon: Crushed curry by SU!